A modern RESPONSIVE Sandvox design to make your site mobile-friendly! 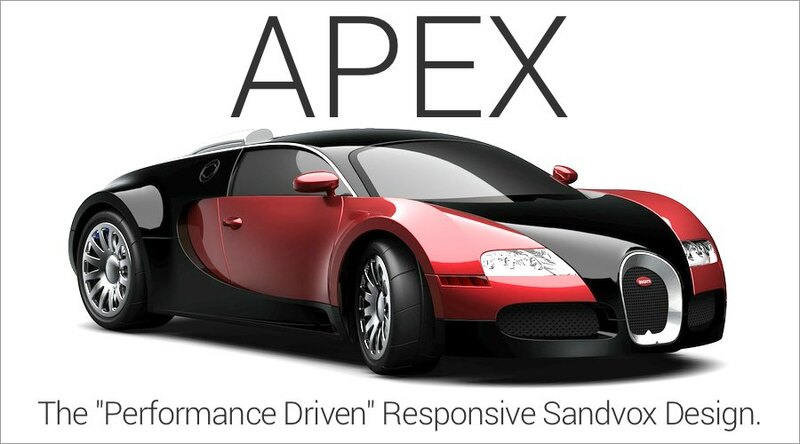 APEX - The ultimate responsive sandvox design! How to purchase the Blueball Apex Design. Click on the "BUY APEX!" button below. You do not need a Paypal account to buy Blueball Apex. Any major credit card can be used. Check Out The Blueball Apex Demo Sites! Download the Blueball Apex user guides to read. Check out everything that the Blueball Apex responsive design has to offer before you buy. Download the Blueball Apex custom images. Use the hosted default Blueball Apex design's background and banner images, or upload and warehouse them on your own site server. Apex instantly converts your Sandvox site to a responsive and mobile device friendly layout with custom banner and background images. Blueball Apex, our newest responsive Sandvox design, gives Sandvox users a design layout with customizable banner images AND page background images! Blueball Apex also provides your Sandvox site with all the mobile-friendly responsive display features current site layouts need to have in place for optimal viewing on all devices. The Blueball Apex design automatically scales and repositions images and other page elements on your Sandvox site pages in a responsive manner for you, providing your Sandvox site the best possible display results in browsers on tablets and smartphones, along with the standard desktop computer display you are used to. The Blueball Apex design comes with 9 color schemes, 16 banner images, and 16 page background images ready-to-use. The Blueball Blueball Apex design comes with loads of cool, responsive, and mobile-friendly features that will help make your Sandvox site stand out from the rest! Be sure to check out the Blueball Apex design features page shown in the nav menu above, the 9 Blueball Apex demo sites, and the two Blueball Apex pdf user guides you can download using the sidebar links to see all that Blueball Apex can do for you and your Sandvox site today. We provide 16 free ready-to-use custom banner and custom page background images for Blueball Apex users that cover a variety of subjects. You can also easily add in your own custom banner and page background images too! Be sure to check out the Custom Banner pages on our Blueball Apex demo sites to see some of our 16 hosted banner and background images in action! You can also download all 16 Blueball Apex default banner and background images to host yourself on your own server directory for your site by clicking on the download link in the sidebar. The Blueball Apex mobile design layout displays the entire banner image when scaled down! The Blueball Apex responsive design layout uses a single custom banner image in it that displays the full width of the content area (1200px) initially on desktop browsers, and spans the full width of the browser window on on mobile devices with screen widths of 768px or less automatically. Note that the entire banner image scales down with no cropping on mobile devices! Banner can be any height too! Sandvox™ is a registered trademark of Karelia Software, and is used with permission.